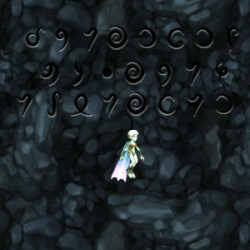 Aquarian, the alphabet of the denizens of Aquaria, appears in the background of many game areas. On my first abortive play, a year or so ago, I didn’t even realize that the strange symbols meant anything. I assumed they were just nonsensical decoration. However, this time, I noticed something. There was a sign at the entrance to the city of Mithalas. On it were 8 symbols, and two of them were identical: symbols 5 and 7. The sign read “MITHALAS” in an underwater alphabet. I’m a fan of the Myst series, so I kicked myself for not realizing the first time that these odd symbols had meaning. To my credit, it’s easy to miss. Reading Aquarian is not required to access any part of the game. There’s no classroom where the letters are laid out with their Roman counterparts. Instead, learning Aquarian is a matter of puzzling it out: realizing that a sign says — must say — “Mithalas,” and then using those seven letters to figure out that the bookshelf is labeled “History.” Before long, an astute observer can read the crazed scrawlings of twisted beasts, or the final letters of long-dead priests. What’s interesting here is that this really isn’t that kind of game. In the aforementioned Myst series, or some cerebral digital roleplaying game, one might expect to have to decipher an alien text. But here, it’s just for atmosphere. The creators decided that they wanted writing on the walls, so instead of using random symbols or English writing, they had Yu’s friend Jon Perry come up with an alphabet that makes perfect sense for the inhabitants of the game. When you think of a game world as a real place, as if you’re writing a story setting, this sort of thing emerges. I felt proud of myself as I figured out Aquarian, and my experience with the game was better for it. the ultima games have an alphabet like this as well, though it’s a little disappointing they’re simple substitutions for english letters. incidentally, i consider learning riven’s numerical system the greatest adventure game puzzle ever made. Part of me wants a game to include a language that’s not just an alphabet cipher. Part of me thinks that would be the worst thing ever. And then I remember The Edifice. I think -my memory is a bit blurry- that actually, the aquarian or mithalan alphabet is the same case as in the Ultima series. It’s simply a substitution of the western alphabet. And while there isn’t a full display of the letters in the game, i’m pretty sure there is a game file that contains all the symbols replacing each letter. I’ve never played Riven (!) but that puzzle seems interesting. However, I think hardly any developer will take the colossal work that is creating an artificial language so it fulfills the economy and comunicability. I won’t say never, but can we really expect to see a full develeped language. altough it may present some great opportunities for puzzles, are the players willing to learn a new language? Take for example klingon or elven in Star Trek & LoTR. Even with the huge fanbase surrounding both, how many people actually learned those languages. And, if it’s not meant to be part of the core experience: How many people will actually take the time to decipher a completely different language with an unusual logic just for the easter eggs? And regarding The Edifice… is it me, or IF is what people should be looking for inspiration? The Ultima runes are also a letter substitution cipher, yes. But they had, I believe, a full transliteration printed in the manuals as a sort of copy protection scheme. And I’d fully expect that sort of thing from the enormous, world-rich roleplaying series that is Ultima. In Aquaria, it’s more unexpected. And yes, IF is a great place to look for inspiration. I mentioned The Edifice, but I really should have brought up The Gostak. Can we really expect to see a fully developed language? Evidently. Are the players willing to learn it? At least a few of them are. Ah… this reminds me of the Commander Keen games. Amazing early platformers (#4 is still my favorite side-scrolling platformer of all time), with a great sense of style, though I suppose today a lot of it would seem cliched. CK had a letter-substitution language on signs in the background, that I spent a lot of time deciphering. It was almost disappointing when I found the secret level with the entire thing translated for you.